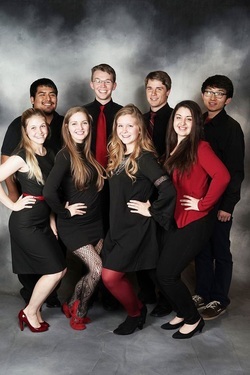 Crimson Cadence is in it's 3rd year as a mixed a cappella/choral octet out of Bloomington, IN. They sing contemporary popular music with a jazz twist, and additionally are known to enjoy the occasional choral ballad, bonfires, and striving to increase their hipness quotient. This year they assisted their director in presenting a clinic on "Expanding the Canon" at the Kettering National A cappella Festival, and competed in the ICCA quarterfinals at Indiana University.